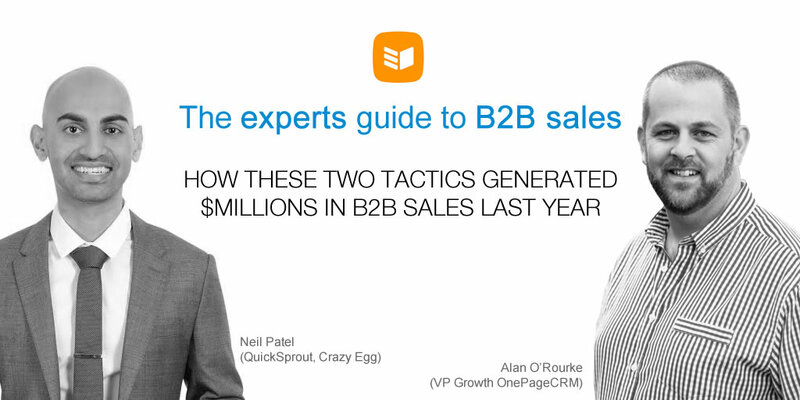 There we have it, the ultimate hackathon in B2B Sales tactics, as presented by Alan O’Rourke and special guest, Neil Patel. Missed the webinar? Catch the recording here. Too many great insights, too little time? 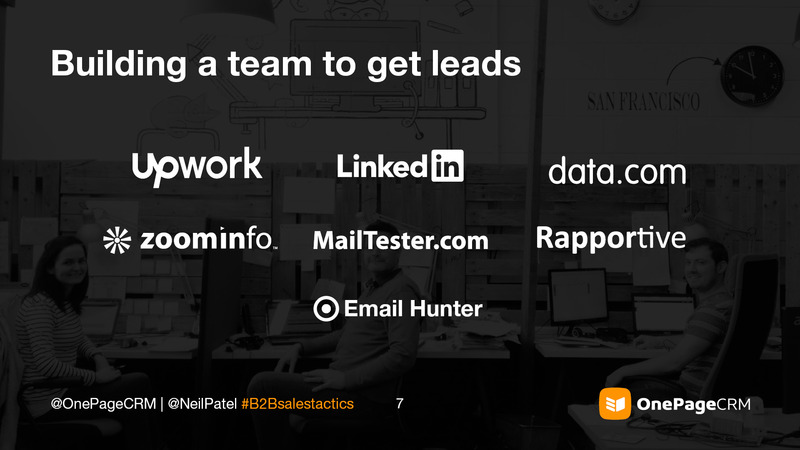 Fear not, here are our top takeaways from the Expert Tactics to Accelerate your Sales webinar. Alan’s top tip for generating highly targeted leads? Outsource! Use freelancer or contractor websites (try Upwork.com, Freelancer.com, peopleperhour.com) to assemble an outsourced lead gen team, for greater flexibility at a lower cost. You’re looking for candidates with a good mix of education, communication and GTD. Right price – work out how much you can pay for a lead and calculate it backwards to how much you can afford to pay per hour. Filter applicants by those who can follow instructions – Tip: Ask contractors to reply with “I have read and understood the requirements” in the first line. Job description – see below for Alan’s go to job spec. Details I require a lead generation expert with a linkedIn account to scrape a list of leads. First name Last name, Title, Email address, Company name, Company size, LinkedIn url and phone number if possible. Please recommend the best way you will approach this task. Please reply with “I have read and understood the instructions” at the start of your application. Ask them what tools they use – If they are using a mix of the following (Linkedin, Data.com, ZoomInfo, MailTester.com, Rapportive.com) then they’re probably a good bet. 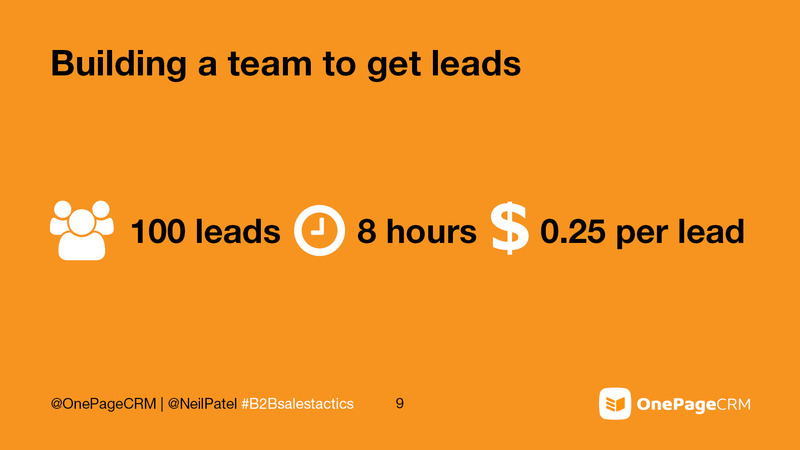 Hire them for a test – Ask them to deliver the 100 leads. It will cost you about $40 but it is worth it. Go ahead and send a prospecting mail to the 100 people and see how many bounce. 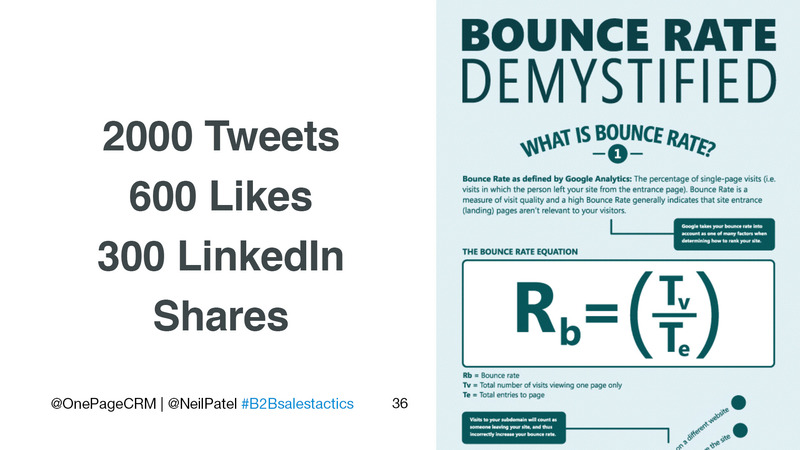 10% bounce rate, good list. Anything above 30%, bad list. Spread the risk – Hire a few people for the job and split the leads between them. Document target profile and exclusions – This is very important to avoid time wasting. 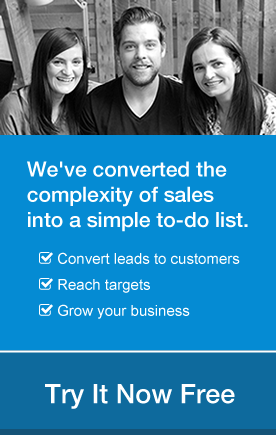 Check deliveries and measure results – Use your CRM to tag your leads and prospectors to track performance. Communicate often – Check in weekly with your team. Set delivery dates well in advance of when your sales guy needs them. Measure – You need to identify who is actually delivering good leads and who is not. Try BriteVerify.com for testing the validity of the contact details recieved. Be vigilant – Bad leads can affect your long term email spam score, so make sure your list is valid before sending out your cold email. Test your emails – Alan tested over 30 different emails before pinpointing the one with the best response rate. 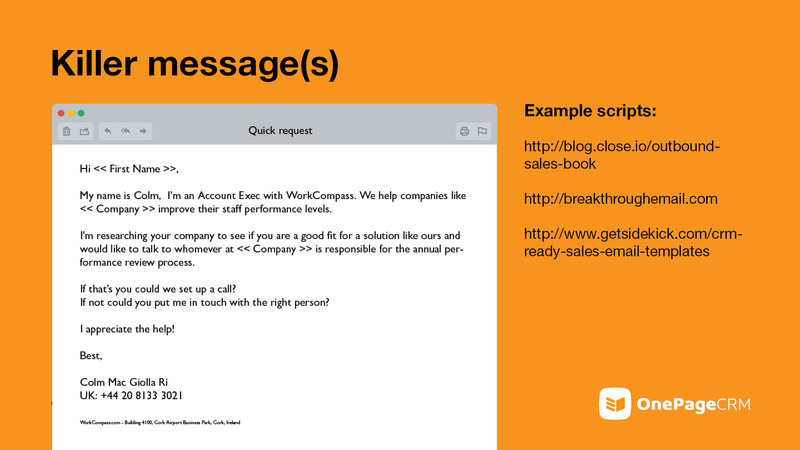 Follow-up – Create a sequence of targeted emails for warm leads and always follow up. Tailor your message and language to your market – Some markets are more susceptible to short, informative emails, others prefer a more conversational approach, testing is key here. Make the emails personable – Emails that sound like they are coming from a ‘friendly’ person, had better response rates. Mention companies you’ve worked with, similar to those you are now targeting. Proof your emails – Add award logo’s or client achievements to the footer of all your emails. Use Litmus.com to check the rendering of your emails, everytime you make a change to the formating or text. Just because prospects may not be interested in your offerings right now, it doesn’t mean they won’t be interested in the future. Invite prospects to opt-in to your mailing list to keep up to date with your business. For more on Alan’s outbound prospecting techniques and free email templates, click here. Get your reader’s attention with a killer headline – If you can engage readers at this early stage you’ll get more clicks. Create content that teaches – Provide actionable, informative content, that people want to implement and share. Write consistently – Plan your strategy for content releases and stick to it, so that your readers come to anticipate your daily/weekly posts. Create a conversation – Don’t treat your posts like a lecture, engage your audience and encourage participation, through comments, social sharing etc. TIP: Ask a question to your audience at the end of every blog post. Tailor your content to your market – Readers won’t engage if the content is not relevant. Keep them visual – as per the example below. Limit the word count – Your aim is to take complex data and make it easier to understand. Keep it relevant – Stick to infographics that are related to solving the problems of your ideal customer. Emails drive 40% of the blogs revenue. Email subscribers are responsible for 35.7% of the blog’s comments. 34% of social shares came from email subscribers. 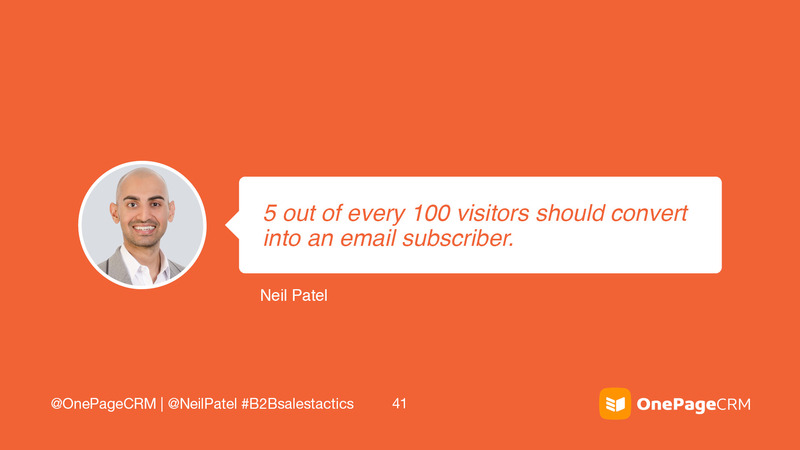 According to Neil, email subscribers will be your most loyal readers. 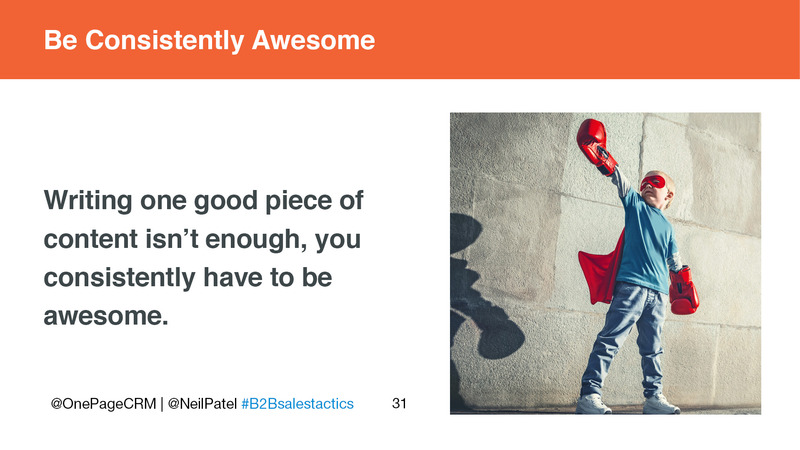 According to Neil, you should be converting at least 5% of website visitors into email subscribers. If you’re converting more, great. Less, it’s something you need to get working on, today. Newsletter boxes – Dated tactic, should still see conversions of 0.5% on this. Sidebar CTA’s – More thorough, offer a bonus ebook, course, additional content, should convert at 1-2%. Pop-ups – Love them or hate them, they work. Keep the design appealing and make it easy for people to exit. Header opt-in’s – Must be really appealing, make people part of the journey by offering something of value. Content Upgrades – Your highest converting offer. Very simple to create. Want to learn more? We’ve compiled our 7 golden rules for lead capture here. 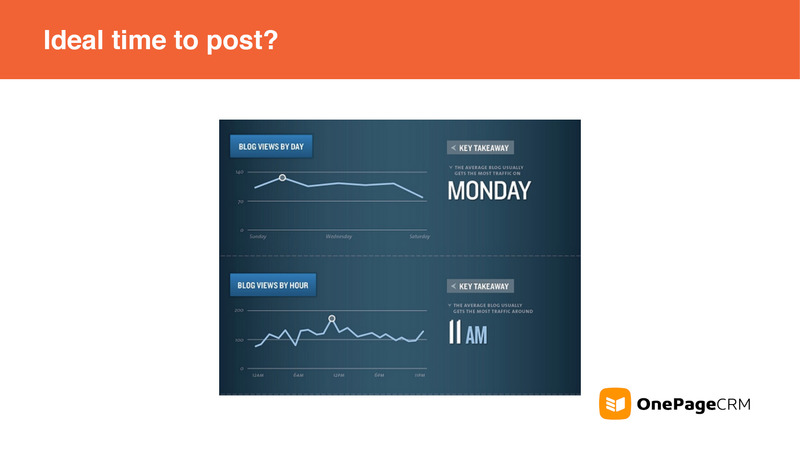 Ideal time to post – Monday at 11am in your timezone, or that which you’re targeting. Click rates on emails are highest early in the morning – Try 6am in your timezone, so that your email is at the top of their inbox. Best sending frequency – 1-4 emails per month. Social sharing – Best time to tweet – midweek & weekends, between 12-6pm. 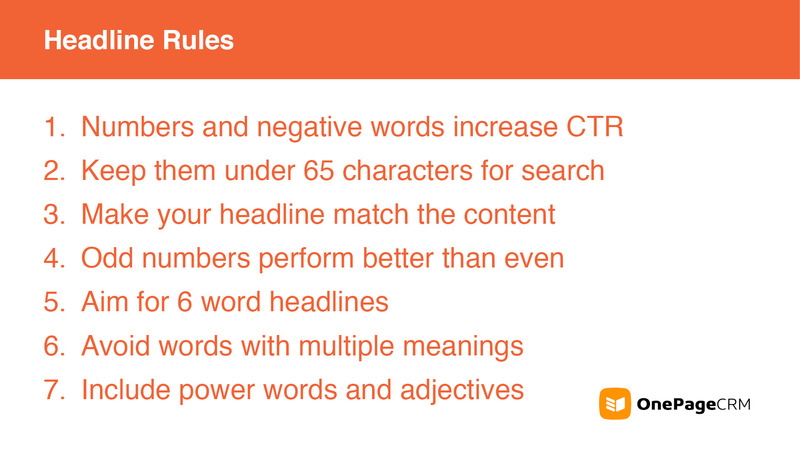 Neil’s rule of thumb: For every 1,000 words of content produced, link out 25 times to external sites. Drop them an email, letting them know you’ve linked to their site and encourage them to share the post to their network. If the content is actionable and relevant, people are generally, more than happy to oblige. 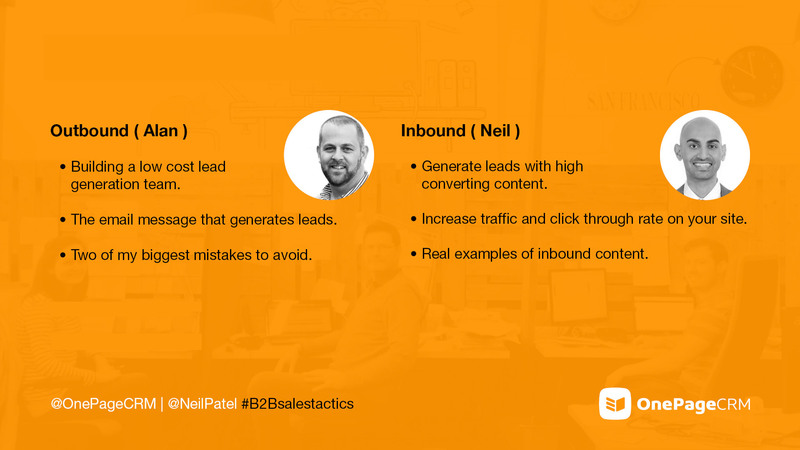 Using these two simple tactics for outbound prospecting and inbound lead generation, Alan and Neil have brought $millions of B2B sales revenue to their prospective companies. What we’re detailing here is not expensive or difficult to achieve, it simply requires taking a smart & creative approach to B2B sales strategy. I hope you enjoyed the webinar – you can check out the slides here. If you have any questions or feedback we’d love to hear it!